After about two weeks it was time to look for eggs and larva in my 2015 summer nucs. I was a bit surprised by one of the nucs. There was lots of eggs and tiny larva as one would expect after a week or so with their new queen, no surprise there. What did surprise me was the two queen cells. I saw the queen, she is a beauty, so I can only guess they got busy with eggs before the queen escaped from her cage. 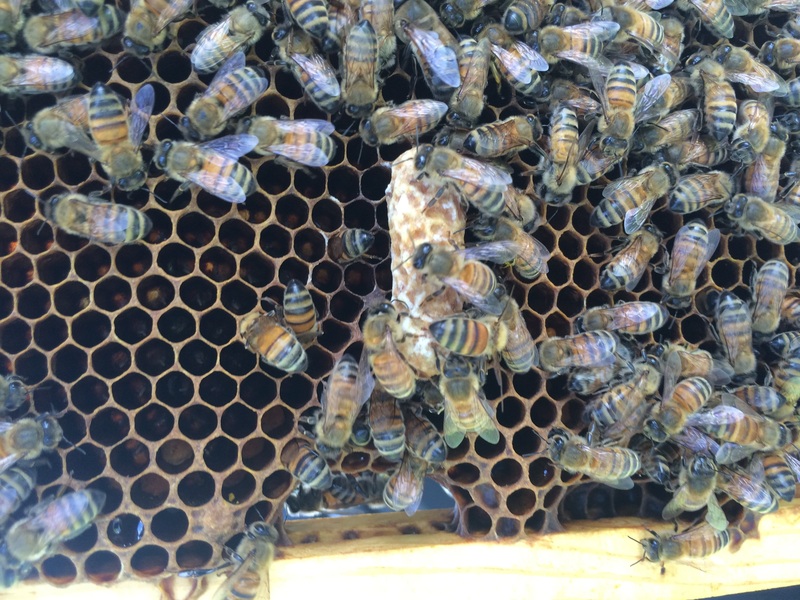 Not being one to waste a good opportunity to help a different nuc, I cut the capped queen cell from the frame and added it to a nuc that didn’t have eggs although I saw the queen. Gladiator style beekeeping! The other queen cell has not been capped so I plan to give it a day and make a nuc from it. Free queens are good queens. If you look carefully there are eggs around the queen cell.